Today we intended to go on a trip to a favourite area… Tasmania’s Tarkine Coast….but I woke up with a new foot problem so it is art at home instead. At least it gave me a chance to finish Catherine’s Beach Collection painting. This photo was taken in bright sunlight today and looks very differnt to the previous one. The actual painting is probably somewhere between the two. Interestingly paintings selected to hang in exhibitions are increasingly chosen from submitted digital files. Tricky. 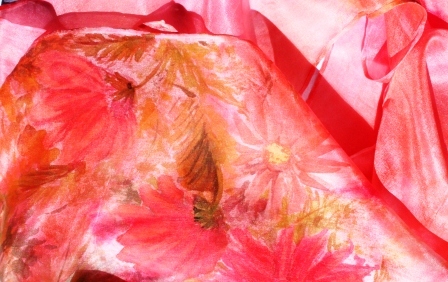 I have also done a silk scarf incorporating a few flowers in watercolour technique (no gutta outline and no antidiffusant). This entry was posted in All things Coastal, Silk painting, watercolour and tagged beach pstones, beach things, daisies, Inktense pencil. 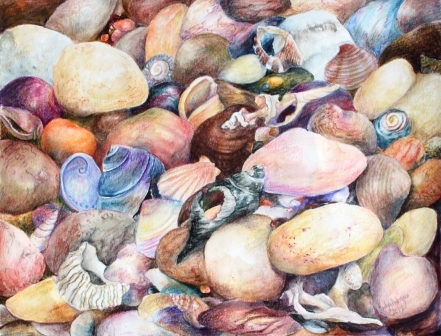 watercolour pencil, shell drawing, shells, silk painting, silk scarf, watercolour on silk.